A system unique to your specific brand for turning the wide range of factual data about a location into sales forecasts, developed by effectively learning the specific statistical patterns that have followed your brand's actual sales performance at individual location levels. Hundreds of complex "spatial" metrics are developed to better represent true local market conditions such as those that are weighted by proximity, represented by a particular drive time, or are based on positions in relation to boundaries. Consumer profiling: Extensive processes are performed to profile your brand's consumers and identify key demographics to target for location selection purposes. These include trade area delineation and analysis, analyzing distributions of customer locations, and testing a very wide range of geographic metrics involving demographics to determine those with the most impact on sales performance. Several other relevant studies and analyses typically positioned as separate services by vendors are incorporated into the process. Examples include the impact of different competitor types, retail brands having synergy with your brand, identifying regional brand acceptance differences, and site quality quantification. Intelligence buried in the brand's operations are uncovered by detecting patterns between sets of metrics and sales levels actually experienced by your restaurants. The right set of performance factors, the specific metrics to best represent those factors, and the relative weights to apply to those metrics are identified. Common statistical patterns we've already identified across many industry brands are referenced while still customizing model designs to your specific brand. Performance factors related to operations (e.g. management quality, customer service, hours of service, store size, location age, etc.) are quantified and combined with factors representing marketing conditions and site quality. 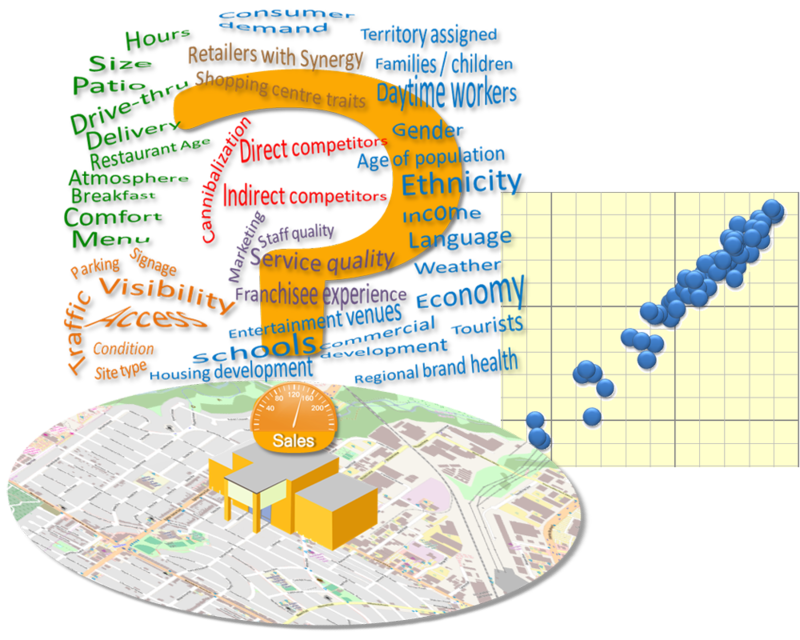 Organizations yet to establish a large number of existing locations can choose to have a location forecasting system that combines statistical patterns common across many brands, our advanced spatial metrics development capabilities and their own preferences as an alternative to a "calibrated" predictive model. Resulting model intelligence is applied in determining optimal location plans and integrated into the "Instant Site Intelligence" system. Much better understanding of what's driving your brand's performance in detail. The ability to pinpoint specific locations that are underperforming in relation to conditions faced. Significant improvement in location decisions, particularly when it comes to identifying location opportunities that are disadvantaged due to market conditions that are not visible through on-site reviews or common demographic reporting and mapping typically performed. Relative same-store-sales potential by restaurant can be better pinpointed and quantified since the model and analysis help clarify operational versus location-related factors affecting performance. Better management of franchisees by being able to determine expected performance levels given the specific site and market conditions faced in relation to actual performance. A system is developed that can be automated across many locations that need to be assessed in a short period of time, including up to tens of thousands of locations across the country.